I was going to make my next baked oatmeal with raspberries and almonds, and actually I did, and you know what? I think I don't like raspberries. So I made it again with peaches. Actually you know what else I kind of don't like, slivered almonds. They hurt my teeth, almonds are better sliced or ground like in macarons or those almond crescent cookies. I'm trying to use up these slivered almonds that I used to use in sun-dried tomato pesto—see, ground. I feel like I just learned something about almonds. I ground and toasted them in this recipe and they weren't terribly present? If you want a more present almond flavor, maybe you could swap in almond extract for the vanilla. Or maybe pecans would be better. Also as pretty as this peach spiral is, thirty minutes is barely long enough to bake peaches especially from frozen; they were just crisp, and I feel like you want tender peaches slightly melting with the oatmeal. So I'm going to say roughly chop the frozen peaches so they cook faster, and besides then you can get more peaches on. Mix together the oats, almonds, baking powder, cinnamon, and salt. 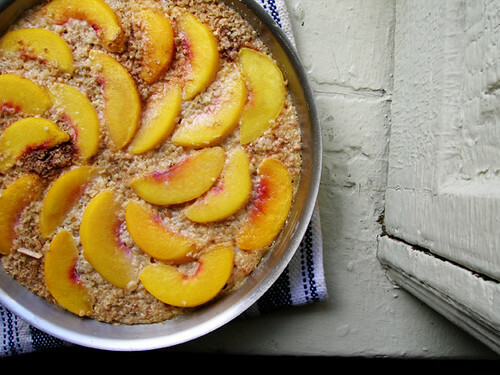 Butter a skillet or 8x8 baking pan, then put the oats in the skillet or pan and put the frozen peaches on top of the oats. Whisk together the milk, honey, egg, butter, and vanilla. Pour the milk over the oats and let it soak in. Bake until the oats are golden and set, about 30 minutes. Remove from the oven and serve giant puffy scoops of oatmeal immediately or let it set up for a few more minutes for perfect slices. Serve with a pat of butter and a scoop of greek yogurt, and some fresh fruit is nice if you have that. Leftover slices can be refrigerated and eaten cold with greek yogurt.